I thought the Gundam at Odaiba was going to be a permanent attraction, but it looks like it'll only be there till the 31st of August. Quite surprising since it'd only been up since July. The weather forecast was for rain, so I thought we'd miss out. I've only been to Odaiba once, way back here in July 2007. It's not a bad place. There's an (artificial) beach you can't swim at, a shopping mall that looks like Europe (Venus Fort), and a fake Statue Of Liberty. What's not to like? Compared to other inner Tokyo destinations, it's costs a little more to get there via the Yurikamome line. 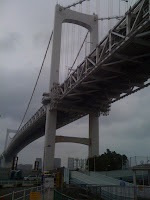 On a special occasion like this, I thought it'd be interesting to get to Odaiba by walking along the Rainbow Bridge. An easy way to get there is to catch a Yamanote line train to the Tamachi station. From there, go out the east Shibaura exit and continue in the same southeast direction in a bee-line to the base of the bridge (Shibaura Anchorage). Staying on the right-hand side of the road you'll find an escalator to take you to the north or south promenade walkway. From April to October it's open from 9-9pm, and 10-6pm the rest of the year. I'd recommend the North walkway. You can see Tokyo Tower and the more interesting skyline. Also the wind will blow the traffic's exhaust fumes away from you. Getting closer to Odaiba, there's an underpass to the South side allowing you a nice view of the other side too. 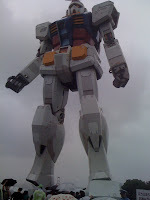 The Gundam was located in Shiokaze Park, on the far right side of Odaiba. Even though there was quite a bit of rain the place was packed with like-minded people wanting to see the impressive life-size machine. We waited in line to go between the legs to touch it, and get a closer look. On the hour, the Gundam came to life moving it's head from side to side (and up! ), and smoke coming out of his chest and jets, looking like he was on fire. The mostly Japanese crowd were vocally in awe of this. Before going home we walked towards Venus Fort and the Ferris wheel. I wanted to see the place where I won my first UFO catcher toy, and to bring back some memories. I think Odaiba is worth seeing at least once on a visit to Tokyo, maybe even twice. You should definitely get there by walking along the Rainbow Bridge. The views are great and it's not hard to do. On the way back we took the South side. Remember too, that although the walkway is on the bottom, second level there isn't any shade from the wind or rain. A lesson I learnt pretty quick with a typhoon rain coming through. If you're in Tokyo you'd want to hurry up to see Gundam. He's on view only until tomorrow! A week ago I was perusing Yahoo Auctions Japan for stuff I don't need, as usual. 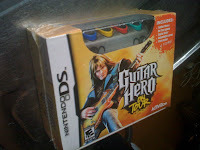 I spied a Guitar Hero On Tour DS game with the guitar grip for 500 yen. On eBay you can buy a non-genuine controller for around the $12 mark, so this seemed like a bargain. Stealthily I put my winning bid at 510 yen in the final moments of the auction. (Unlike eBay, Yahoo extends the auction time). Luckily no one upped my bid so it was mine! Of course postage was extra. With Yamato's COD it was 640 yen for delivery, and the highway robbers, oops I mean UFJ bank took 262 yen for the bank transfer. Still, I got it for a great price. I was half asleep early yesterday morning anticipating the delivery guy's knock on my door. Just before noon it arrived. It was wrapped well with bubble wrap and gift wrap like a present on my birthday. nice. I was quite surprised that under the paper the box was still in unopened shrink-wrap plastic. It was brand new! Also it had the original 4,760 yen sticker price on it. I did well, ne? It was my day off today. I woke up about 12:30pm. I played Guitar Hero until I went cross-eyed. I'd planned to go to Akihabara today to look at a replacement camera for my Nikon, but got stuck with family tech support again. There seems to be a sense of urgency. This weekend is the last chance to see the giant full-size Gundam in Odaiba. I thought it was going to be permanent but apparently not. I really don't want to miss out on this photo/video opportunity. Woah, it's been a while since I wrote my last post eh? I thought it was good to have a moment's radio silence to take a break and to give myself a little privacy for a while. So what did i do in Brisbane? What IS there to do? First few days I just chilled out and didn't do too much, a look around the city, a Boardwalk Cafe coffee at Southbank. It was great to drive my car around. I got a surprise visit from my brother in Sydney. Before I left Tokyo I was thinking of going down to Sydney to visit him. Lucky. It was a surprise that could've gone horribly wrong. We went to Steve Irwin's ("The Crocodile Hunter") Australia Zoo, an hour's drive north of Brisbane on the Sunshine Coast. They let us touch the kangaroos and koalas, as well as feeding the elephants. It's a little pricey at $54, but I think it was worth checking out. Another worthy excursion to do in Brisbane is to ride the City Cats, the commuter ferries that run up and down the river. For $4.40 (off-peak), it's cheap and a great way to see the city from the water. During the day, the temperature was great. It was constantly around the 26 degree mark. Hard to believe it was winter. A night it was a little chilly but there were still people going out in T-shirts. It was great catching up with old friends. A drink at the Down Under, visiting a friend in Toowong, eating a nice Korean meal. I even visited my old workplace to see who was still around. I was surprised to see a lot of the old faces. It was great to feel that familiarity. It's the thing that makes me miss home the most. I brought back the usual "food run" of cheese, Di Bella Coffee and biscuits. I also brought emergency supplies of medicine, deodorants and other bits and pieces. My hard drive is running out of space so I got a 500GB portable drive and DVD DL burner for backups. I think I'm prepared. I left my SLR to my dad so sometime I'll be looking for a new one. I watched a few movies while I was there. I rented out "The Curious Case Of Benjamin Button" (good), "The Science of Sleep" (looks good, but confusing), and watched "Yes Man" (better than I expected) on the plane. I hadn't been to the cinema in years now, so desperate to watch a film on the Imax I settled for "Bandslam". It's a typical FAMILY film. Vanessa Hudgens was in it. 'Nuff said. All I could think about was her leaked internet pictures, to excuse her bad acting. Not a bad film, definitely forgettable though. It's been almost a week now back in Tokyo. Business as usual really. The week went by so fast. Tokyo says "Irrashaimasu", but I think she doesn't mean it. I was feeling lucky today. Yes, I played the UFO Catchers again.. I saw a black motorised Pingu that was in a pretty good position, but I was after the white one. I asked them to move it, and he kindly put it in an even better position! It was a 100 yen machine, so on first go it just gave it a little push, but on the second time, it started to go and with gravity on my side it fell down. Just 200 yen! For anyone that cares, it was won in the UFO Catcher with no name on the east side of Shinjuku Station. Just put this: 35°41'25.37"N139°42'8.47"E into Google Earth/Maps and you'll find it. I was going to do a video of the actual catch, but by myself I was worried a lack of concentration might make me fail, so you'll have to do with a video demonstrating the little guy walking across my Mac. After that we had some 30% donuts from Mister Donut. Not bad but not as good as Krispy Kreme I think. I minded the seat next to me with our food tray, and a dumb gaijin girl told the gf it was hers from putting a cloth on the seat. We were there first biatch! You know who you are. Go back to your country. They even left their food tray there when they left. BAD GAIJIN, making the rest of us look bad. I tried my amp on my el-cheapo trolley. It doesn't seem that strong. Crossin' my fingers.. Only three more sleeps to catching that plane!! A first for me is going to Yokohama's big fireworks in Minato Mirai. I went straight there after work armed with my SLR and a change of clothes. From the moment I got on the train I could tell it would be crowded. I always want to take a picture of a packed train, but it's too hard to take the camera out of my bag. There were people everywhere. Lots of girls in yukata too. We planned to walk to Yamashita Park for a place to eat, sit, watch and drink, but it seemed we walked in almost a circle to end up near Landmark Tower anyway. At least I finished one of my chu-hi along the way. The fireworks started at 7:15pm. We found a comfortable place to sit next to the Nippon Maru ship, but a tree was in the way, so we moved along slightly and sat on the wall, with the only obscuring view was the Intercontinental hotel in the way. Still, as you can see I managed to take some nice photos. I ate some yakiniku-style pork and rice. The grapefruit chu-hi is cheap and nasty, like my women. I played around with shutter settings to get some neat effects. These would've come out better with a tripod, and without drinking alcohol. Taking a photo of me pretending to look at fireworks. The Landmark Tower behind me is the tallest building in Japan. Did you know? The fireworks finished up around 8:30pm as you can see by the clock on the Cosmo Wheel. A couple wearing yukata. Overall it was a fun little outing. I missed a school party tonight, but I really wanted to catch at least one fireworks show before Summer's end so I think it was definitely worth it. On the train I had my third chu-hi, this time a milder peach-flavoured one to keep me inebriated on the longish trip back home.